Here's a brand new Instant game from Playtech - try online slots in the UK at Wizard slots now! With one of the best gaming selections on the market, Playtech has themes from popular films, comic books, sports and uniquely conceived concepts. Throughout this wide range, many developer trademarks remain consistent, each holds its own simplistic graphics style and smooth animation to add to the intense gaming experience – most Playtech video slots also contain 5 reels and a range between 15 and 25 available paylines. Despite many games holding some form of consistency, it is the differences between each title that allows for players to find their own preferred game, developing a much-valued replay appeal. You can check our video slots games here from Playtech here. Match Point! Playtech is serving up their own rendition of Wimbledon in this 5-reeled, 40 payline video slot. The interface found below the reel gives players many varying options to edit and customise the game to their own personal tastes whilst also informing gamers on the features throughout. Selections such as Game Options, Auto Start, Bet Per Line, Bet Max, Gamble and Spin are all you will need to navigate your way through. Setting the Bet Per Line or Bet Max feature will dictate the amount spent per spin as well as the potential returns. The can be edited at any time between spins, many players may choose to increase their risk when they have received several large pay outs. One of the highest earning features within this game is the Gamble option, when a winning payline has been found players have the chance to double their money with a simple 50/50 guess. Once the amount has been declared, select gamble to bring up the mini-game screen, at this point players will be asked to guess the colour of the next playing card to be revealed, guess correctly and double your rounds earnings, guess wrong and your winnings for that round return to £0. Correct guesses can also be rolled-over so players can continue to double for a maximum of 5 rounds. Tennis Stars hold several base game bonuses, beginning with the Wild that appears within reels 2,3 and 4 this card can act as a replacement for any other non-bonus symbols to provide players a winning payline. In addition to this if Wilds are located on all 3 possible reels a Free Spin round will be triggered. With 15 Free Spins players will also receive a x3 multiplier for all winning spins. 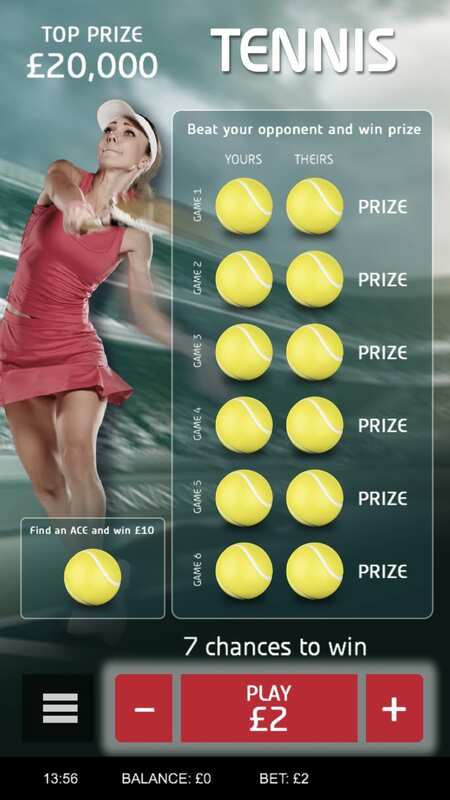 As well as Wilds Tennis Star also holds Scatters, finding 3 Scatters anywhere on the reels will take players to the Championship Match, a feature that produces even more Free Spins for players to continue to win without the cost of a wager. Sporting themed video slots are always a popular gaming genre, Tennis Stars sets its self apart from the crowd with its extended plethora of bonus features. Allowing players, the option to roll over their winnings gives high rollers the possibility of a new style, by gambling conservatively they can then choose to maximise their winnings using additional methods. Scatters and Wilds are two features that are quickly becoming staples in modern-day video slots, introducing a Wild and adjusting its bonus for the better gives Tennis Stars the edge over its direct competition – earning that match point.